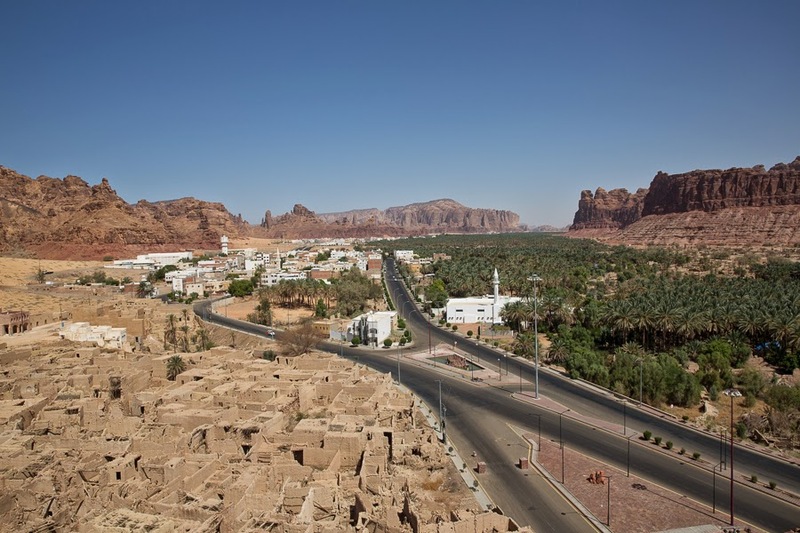 Al Ula, the gateway to Mada’in Saleh, is a small town about 400 km north of Medina. Once an oasis with fertile soil and abundant water, it was founded in the 6th century BC and originally inhabited by the Lihyanites. The town was formerly a strategic trade route for spices and incense from the Levant, Egypt and North Africa. The 2,000-year-old ghost town was made of stone and mud. The preserved archaeological site still contains many distinctive tombstones and inscriptions written in ancient Nabatean scripts, which historians believe was an old form of the Arabic alphabet. Walking through the narrow corridors of Al ‘Ula in northwestern Saudi Arabia is like traversing a maze, with ancient history at each turn. 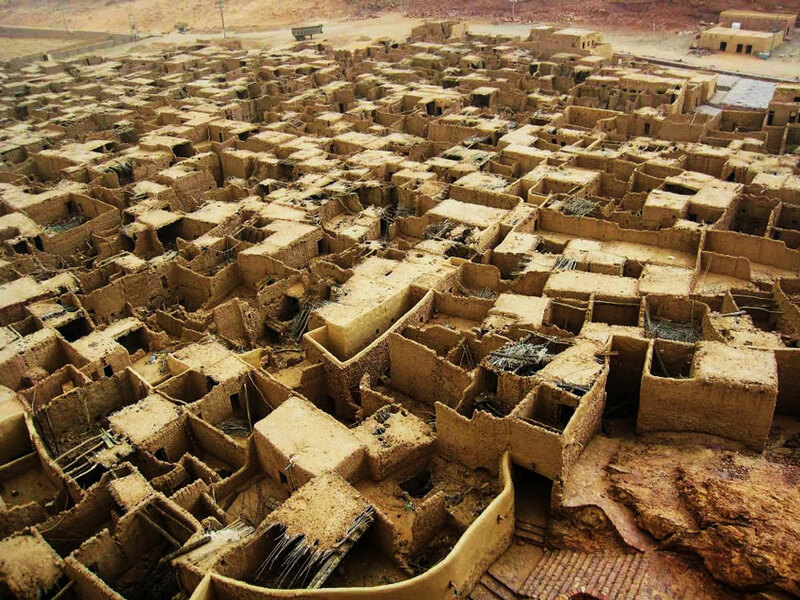 Once a bustling civilization, these 800 tightly packed mud-brick and stone houses — parts of which are more than 2,000 years old — are now abandoned ruins, decaying in the hot desert sun. The City is was located along ‘Incense Road,’ the network of routes that facilitated the trading of spices, silk and other luxury items through Arabia, Egypt and India. The abandoned city has religious significance as well; Muslims believe Muhammad passed through Al ‘Ula — located about 380 kilo meters (240 miles) north of the holy city of Medina — in 630 AD on his way to the Battle of Tabuk between the Arabs and the Byzantines. In the 20th century the new town center was established beside the old town and eventually the people left the old buildings. The last family is said to have left in 1983, while the last service in the old mosque was held in 1985. Both the ruins of the medieval town and the site of the Liyhanite settlement now lay within the limits of the modern town. Mada’in Saleh, also called “Al-Hijr” or “Hegra”, is an archaeological site, within Al Madinah Region, the Hejaz, Saudi Arabia. Situated roughly halfway between Petra and Mecca, it is the second city of Nabateans. The Nabateans were the ancient people of the Middle East who became wealthy through the caravan trade between Southern Arabia and the Jordan Valley. They are most famous for the magnificence of their capital city -Petra, which is one of the Seven Wonders of the World. While many people have heard of Petra in Jordan, Madain Saleh, the Nabateans’ second-largest city and a UNESCO World Heritage Site, remains relatively unknown. 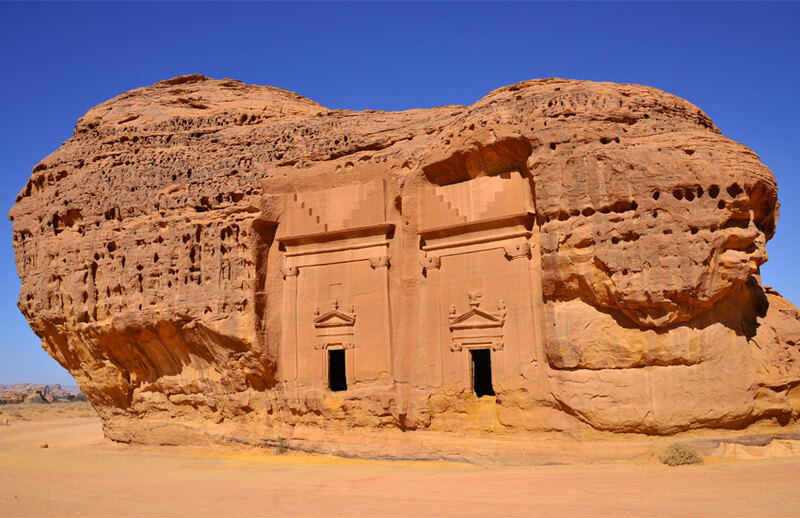 Mada’in Saleh is considered the most enigmatic sites on the Arabian Peninsula, though it is not popular as it should be. Structured from several large boulders that rise out of the flat desert landscape, and similar to Petra, most of the structures were used for funerals only. 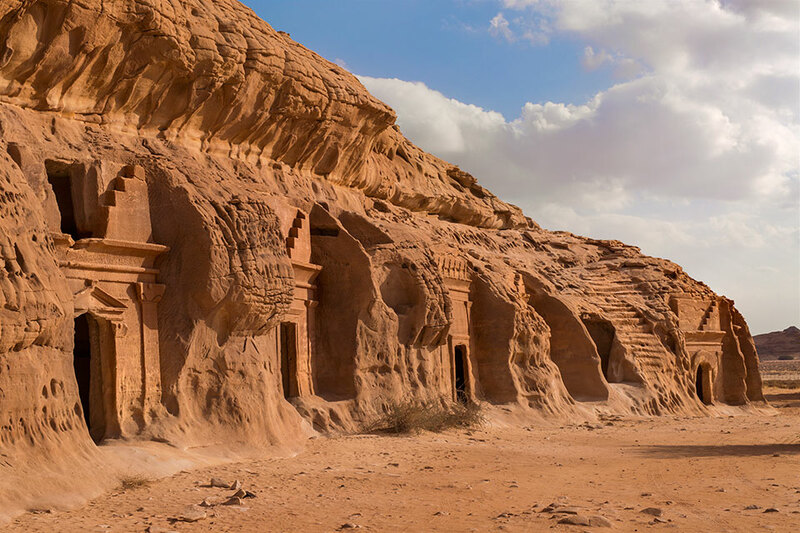 Mada’in Saleh still contains 131 tombs that have been cut into its surrounding rocks. In 2008 UNESCO declared it as a world heritage site. 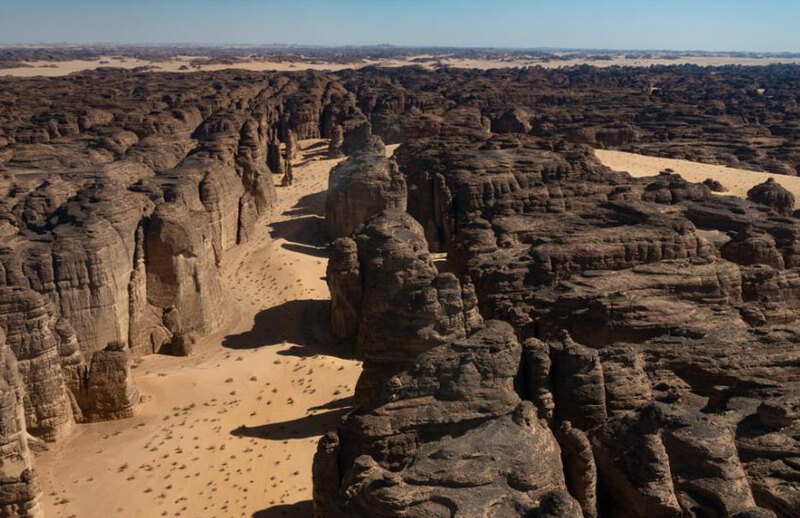 The grandeur of the natural setting here must have reminded the Nabataeans of their capital, Petra, chopped into the rosy sandstone cliffs to the north in modern-day Jordan. It is no wonder that they chose this very spot to build their second city, Hegra. Based on the many dated tomb inscriptions, Hegra thrived between 1 BCE -74 CE. The Nabataeans began as pastoral nomads, raising their sheep, goats, and camels in the desert as so many other Arabian tribes have done through the millennia. They also practiced oasis agriculture, utilizing a set of wells dug into the rock. Their origin is uncertain, but there is a strong possibility that they came from the Hejaz region of northwest Saudi Arabia. The deities they worshipped were similar to those honoured by ancient cultures in that area and the root consonants of their name – n, b, t, w – occur in the early Semitic of the Hejaz. From early in their history, they had connections with Mesopotamia and may have been the Nabatu Arabs mentioned by the Assyrians in the eighth century BCE. Prince Abdul Majeed bin Abdulaziz Domestic is the nearest airport located 25 kilometres southeast of Al-Ula. From the airport one can catch a taxi to reach the location, it is just 20 minutes ride. The best times of year to visit Al-`Ula for hot-weather activities are from mid May to mid July and from late August to mid October.